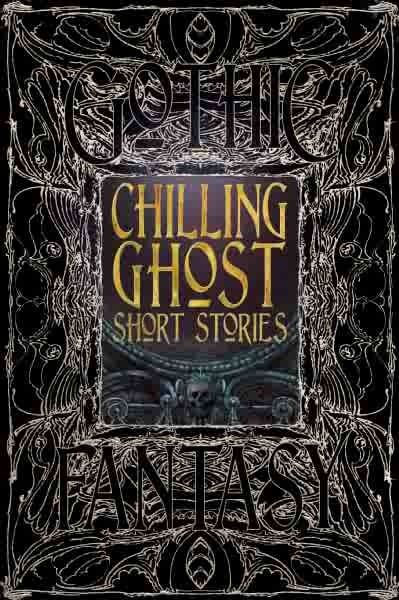 Flame Tree Publishing Editor Gillian Whitaker has officially announced the contents of their upcoming anthology CHILLING GHOST SHORT STORIES (cf. July 22, 6, June 21). One of three, to quote their blurb, “collectable Gothic Fantasy anthologies, deluxe hardcover editions on Horror, Ghosts and Science fiction, each carry a potent mix of classic tales and new fiction, tracing the path of the thrilling tale from the early gothic to the modern fantastic.” The book itself is expected to be available in the US by about the end of August. More information including lineups for Flame Tree’s companion volumes CHILLING HORROR SHORT STORIES and SCIENCE FICTION SHORT STORIES can be found here, with a more detailed peek into the editorial process available here. Well, this is more a horror site than science fiction which may explain why I , too, haven’t read (at least all the way through) a majority of these, but I don’t really claim to have read them all either. However as August approaches, for summer lazy-day reading pleasure, perhaps one might pick a few on the assumption they’ll not only be fun but worth one’s while. As compiler Charlie Jane Anders explains it: “Science fiction and fantasy offer a rich legacy of great books — but that abundant pile of reading material can also be daunting. So sometimes, it’s easier to fake it. We asked some of our favorite writers, and they told us the 10 books that everyone pretends to have read. And why you should actually read them. The list itself is from IO9.COM and, truth to tell, I just happened to blunder across it on Facebook. Regardless, press here. Just as the summer is starting to get warm, today brought the Bloomington Writers Guild’s (cf. May 31, et al.) annual summer “Potluck Social & Open Mic,” along with the announcement that next Sunday will bring the start of the “new” season with August’s opening “First Sunday” prose reading. And so the world turns. The snacks part of the summer potluck included rolled sandwiches, hot baked beans, two kinds of potato salad, dolmades, cake, apple slices, melon and berries, and several choices of soft drinks, of which latter my offering of cold lemonade proved an early favorite. Then came the readings with prose — fiction and essay — as well as poetry from possibly ten or a dozen participants. Mine in the mix was poetry (since I’ll have to have some prose to read next week, plus more for an upcoming Arts Fair reading the first weekend in September), two relatively new, or at least thus far unsold vampire poems, “The Etiquette Vampire: How to Retain One’s Lover After that First Penetration of Fangs” and “Her First Time”; “Necropolis,” a three-line shortie concerning the relative lack of noise complaints in graveyards, recently accepted by NOTHING’S SACRED (see July 6, June 24); and a personal favorite, “On the Other Hand,” a tip of the hat to actress Fay Wray and why her romance with King Kong couldn’t last, hopefully soon to appear in GRIEVOUS ANGEL (see March 30, et al.). These things sometimes come in clusters don’t they, or, another anthology has been updated including a hoped for end-of-August release. 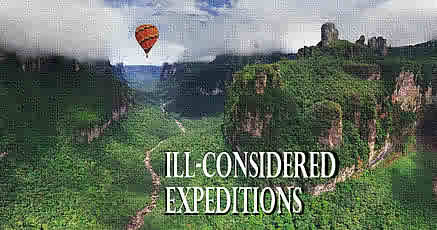 Thus came the email Thursday evening from April Moon Books’s Neil Baker noting that, with tasks completed (or at least come to stopping places) for two other books, “I can now finish off the proofing for ILL-CONSIDERED EXPEDITIONS. My trip in this tome is “Ice Vermin” (cf. March 10, January 13), originally published in EXTREMES 5 (Lone Wolf CD ROM, 2003; also reprinted in my collection DARKER LOVES: TALES OF MYSTERY AND REGRET), the tale of a pre-World War I trek through darkest Siberia — and, it might be mentioned, perhaps extra refreshing should we be into high 90s-plus temperatures by then (summer in these parts, at least, appearing to come late). So here’s another to look for at the end of next month, more on which will be noted here as affairs progress. 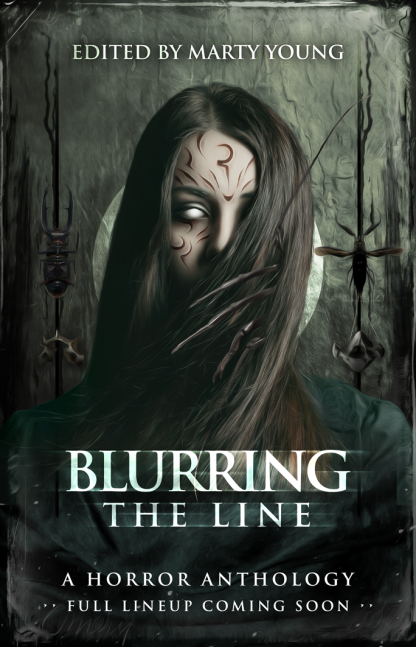 The word is out that Flame Tree Publishing’s upcoming CHILLING GHOST SHORT STORIES anthology (see July 6, June 21) is at the printer, along with two companion volumes, CHILLING HORROR SHORT STORIES and SCIENCE FICTION SHORT STORIES. The printer, in turn, is located near Venice Italy with delivery expected in the UK by mid-August, and from there to the US distributor by, hopefully, that month’s end. My part in the potpourri is called “Victorians,” originally published in GOTHIC GHOSTS (Tor Books, 1997; also reprinted in my 2001 collection STRANGE MISTRESSES: TALES OF WONDER AND ROMANCE), a story of architecture and awakening memories, and will rub shoulders with offerings by other current writers as well as such past giants as Willkie Collins, Washington Irving, Algeron Blackwood, and Sheridan Le Fanu. More information, including ordering when the time comes, will be passed on as it becomes known. Thus rock star Rod Usher is convicted of killing his wife and sent to the local insane asylum run by, if not “The System of Doctor Tarr and Professor Fether,” the equally cracked Dr. Calahari (played by Russell himself), assisted by buxom and oft-groped nurse ABC Smith, “whose [to quote the back-cover blurb] mind-blowing shock treatments set off a series of bizarre, nightmarish adventures.” Other assistants, patients, relations, and/or references include “Berenice,” Valdemar (as in “The Facts in the Case of M. Valdemar”), etc., including, in that this becomes a detective tale too, Gory the Gorilla (as borrowed from “The Murders in the Rue Morgue”). And, Rod being a rocker, there are songs as well, or at least snippets thereof including a rap piece with overtones of “The Bells,” a rock song that quotes “The Conqueror Worm,” and most luscious of all, a rock video treatment of “Annabel Lee.” And more! 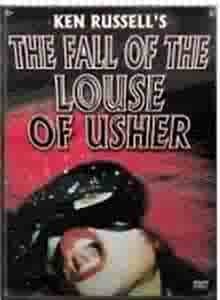 To paraphrase one of its reviewers, THE FALL OF THE LOUSE OF USHER is at heart a series of ten-minute takes in filmmaker Russell’s back garden with his friends and neighbors, done ultra low-budget. But also allowing him total control. 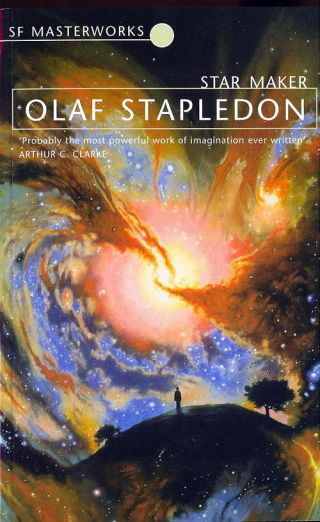 And that’s where the ALICE IN WONDERLAND aspect comes through for me, that book also being a succession of takes, one mini-adventure, one new and eccentric character met following after another, presenting a broadening but never complete, surrealistic view of a world of madness. But madness still with a sophistication, a story behind it. Love it or hate it, following the lead of seemingly most of the film’s reviews — I myself could have done with a bit less gratuitous phallic imagery, though in fairness there’s really not that much. So maybe you shouldn’t show it to the kids. But otherwise, in late 1960s parlance: Man, what a trip! It came as rather a surprise, the Facebook message from Frank Roger on July 7: “Dear James, I noticed you had a story in British magazine HERE & NOW, issue 7, back in 2006. I had several stories in that issue, but never received a copy. Did you, and would you have a spare copy? If not, could you send me Xerox copies or scans of this issue’s table of contents and the pages with my stories? Thanks in advance!” This one took a bit of detective work — nearly ten years old? But I finally ran it down. It turns out I’d never received one either. And, long story short, July 8th dawned, and during the course of the day Jenny emailed us both. Physical copies were still available and, with the receipt of a mailing address, copies would be put in the mail. And so, today, mine has arrived including the story that I had in it, “Oriental Mist,” a breezy romance concerning pheromones and Chinese cooking — spicing up one’s marriage, as it were, and dinner as well. Although perhaps a bit out of date in terms of some of its social mores (one might note that “Muffy’s” dress shields are a little quaint for even then), might it be time for me to find somewhere that might reprint it? Thus is the writing life — but one final item too. 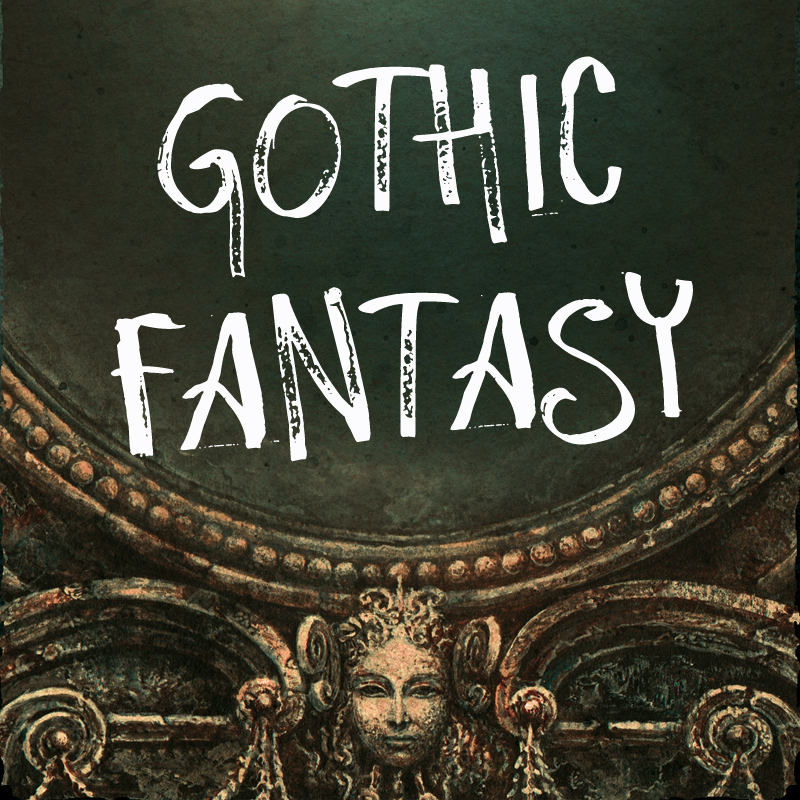 During the course of the “conversation” Frank congratulated me on my sale of “Victorians” to Flame Tree Publishing’s CHILLING GHOST SHORT STORIES (see July 6, June 21), noting that he’d sold one of his own to a companion volume, CHILLING HORROR SHORT STORIES. So now in a few weeks perhaps there will be two books that one might consider buying. And also, a big “thanks” to Jenny Barber! I had started watching Elvira on TV Sunday hosting the original NIGHT OF THE LIVING DEAD, but not quite in the right mood for her wisecracks, switched to a DVD of THE HORDE (a.k.a. LA HORDE), a very violent — and very well done — French zombie film which had just arrived from Amazon UK maybe the day before (since it was cheaper in England even with the postage, even getting it new, and I don’t have any problem with PAL format). Ironically, since I usually watch these in the original language with subtitles, the British disk has an English language dub as well, while I understand the US equivalent doesn’t. One thing about The Horde also though (and I think it’s picked up in some of the reviews) is that the use of sound is extremely well done, and the “background noise” becomes very important by the end. The main objection some critiques have is that none of the characters are particularly likeable: It involves French police having to join with gang bangers to fight their way through a zombie, um, horde — but the cops are corrupt bastards who’d originally attacked the crooks in an abandoned high rise because the crooks had previously killed one of their fellow cops (and who, despite his being married, the sole policewoman member of our merry band had been sleeping with — but, well, it is French). There are also poor people still living in the building including a particularly politically incorrect (he refers to the zombies as “Chinks” throughout) elderly veteran of Dien Bien Phu (the engagement after which Charles de Gaulle reportedly warned President Eisenhower that the US ought not get involved in Viet Nam — Eisenhower didn’t listen), two Nigerian crooks who had apparently had their own violent past in Africa, the still-resident apartment security man who has a weapons collection stashed in his office, and one particularly over the top battle between the lead policeman and “La Horde” in the building’s underground parking garage which, yes, is probably not 100 percent believable but, still, Wow! Also, for those who pick sides between slow zombies and fast zombies, these guys are FAST — and, re. the unlikeable characters rap, yes, guilty as charged, except at the same time they’re delightfully quirky. Also the film is quite nihilistic (speaking of THE NIGHT OF THE LIVING DEAD, original version). film starts off a little bit slow but once in gear, and not very far into it at all (though I understand there is a version with about 8 minutes more set up at the beginning, but only available in Germany — it is, however, included in “Deleted Scenes” in the Extras), it doesn’t let up for a moment. 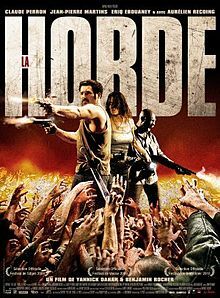 This will not be everyone’s kind of film, but if you should feel the urge to watch an ultra violent zombie film, THE HORDE would be a good pick. And don’t miss what one critique called the “ultimate cat fight” between our policewoman friend and a female zombie who tries to jump her in an apartment kitchen (e.g., use of a refrigerator as a weapon). *So, okay, what does this have to do with zombies? 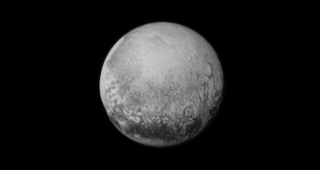 Well, maybe Pluto’s ambiguous “undead” planetary status, or else perhaps simply that it’s cool, for more on which check here and, for a special downloadable NASA app, here. This may seem a bit off the beaten track, but as a writer I’m interested in other expressions of art, and I came across this courtesy of Openculture.com via LinkedIn, the world premiere performance, on November 20 2013, of an instrument invented by and built from plans by Leonardo di Vinci. Yes, that Leonardo da Vinci. To quote from Openculture’s description: “As the archetypal example of the polymathic, intellectually omnivorous ‘Renaissance man,’ [da Vinci] not only attained mastery of a wide range of disciplines, but did his most impressive work in the spaces between them. Given the voluminousness of his output (not to mention the technical limitations of fifteenth-century Europe), many of his multiple domain-spanning ideas and inventions never became a reality during his lifetime. 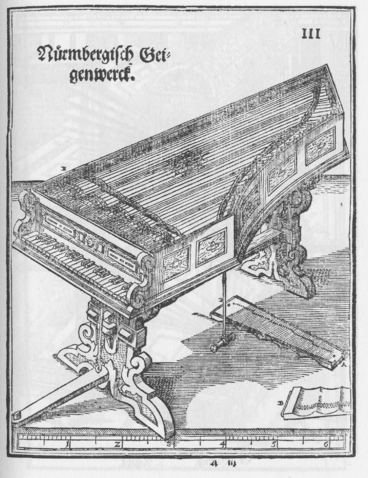 However, just this year, 494 years after Leonardo’s death, we now have the chance to see, and more importantly hear, one of them: the viola organista, an elaborate musical instrument that had previously only existed in his notebooks.” The piece continues, in part itself quoting builder and player, Polish concert pianist Slawomir Zubrzycki, “'[t]his instrument has the characteristics of three we know: the harpsichord, the organ and the viola da gamba,’ and playing it, which involves hitting keys connected to ‘spinning wheels wrapped in horse-tail hair,’ and turning those wheels by pumping a pedal below the keyboard, produces exciting unusual waves of cello-like sounds.” To read more for possible Renaissance/steampunk/alternate history inspiration, but also simply to hear for oneself the 10 1/2 minute premiere performance, one need but plunk here.